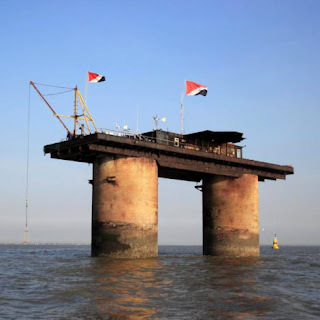 We’ve had a passing acquaintance with the Principality of Sealand, one of the constellation of micronations whose territory consists of a disused anti-aircraft platform off of the coast of Suffolk, for a few years and even knew of the coup d’état and the power struggles, but we sorely failed to appreciate the outsized intrigues (recommended by Digg) that this rather long-lived, tiny princely state has experienced—with the overthrow and leadership in exile being a far more dramatic and stranger story than we had supposed. 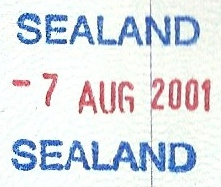 In addition to this singular offensive, the micronation’s uncertain legal status and sovereignty has been co-opted by a rash of pretenders, including an operation to issue ten of thousands of passports in the name of Sealand, unofficial, unsanctioned internet presences, shell companies and claims of diplomatic immunity by dint of above fabricated associations. For this dynastic enterprise that began as a pirate radio station to escape the hegemony of the BBC, subsequently proclaiming independence and creating all the trappings of statehood, it’s disheartening that it is yet attended by this persistent and darker, parallel version of itself and we hope that going forward, in keeping with the spirit of staking one’s independence, that the Principality is allowed to tell its own story.